The 460 wide flip lid model (460mod) is a robust and durable cash drawer providing low cost of ownership and excellent customisation options, therefore becoming the automatic choice of market leading retailers. the cash drawer can be designed to suit any retail environment including the colour of the checkout furniture and compatibility to the epos equipment. a stainless steel finish is also available to maintain the surface easily and to meet health and safety requirements. the standard high capacity insert features 8 coin and 4-6 note compartments, but it can vary to suit individual needs. the option for integral lockable lid ensures secure transport of the insert to the back office and cashier accountability for the retailer. 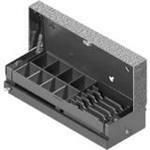 another option is a separate lockable lid that can be easily attached to the insert. the high security 460mod04 series of flip lid drawers features a steel front-plate that makes the drawer virtually impossible to prise open so, when the drawer is left unattended, it is more secure. the depth of this type of drawer is 175mm.